I love to say it. Creme Fraiche (pronounced “crem fresh”). There’s something so gourmet and cultured sounding about it (no pun intended! ), and yet it is one of the simplest types of cultured dairy that you can make. Basically, creme fraiche is cultured cream. It’s that simple. For some reason I held off trying it out for a long time. I was so happy to discover that creme fraiche is actually ridiculously easy to make. After I tried it for the first time, I couldn’t believe it had taken me so long to give it a go. It just tastes so good and adds such a wonderful touch to my meals. It provides us with extra enzymes to help us digest our meals, especially those with meat or grains in them. Another easy way to get more cultured/fermented foods in our diet! Even the organic sour cream I buy at the store contains stabilizers and thickeners (skim milk powder, tapioca starch, guar gum, carageenan), rather than just relying on bacterial cultures to do all the thickening work. Those ingredients just aren’t necessary. I’d rather stick to the simplest list of ingredients possible. It can be more cost effective than purchasing organic sour cream, even when made with organic or raw, grass-fed dairy (depending on the cost of what’s available to you). For those who can get an abundance of raw milk, you can make a product infinitely more nutritious than what is sold in any store! Start with a glass pint jar. Add about 1-2 Tbsp of cultured buttermilk to the bottom of it. I used store-bought, but if you like to make your own, that would work just fine as well. Fill the rest of the jar up with heavy cream/whipping cream. If you like to skim yours off of your raw milk, more power to you. We don’t get enough raw milk that I’m willing to give up all that cream that makes it so lovely. I usually prefer to use organic cream or another local brand that raises their cows better, but this time I was stuck with the regular store stuff. Even with regular store cream, it’s still so much better than buying sour cream with all the stuff that they put in it. I use plastic screw lids that are made to fit canning jars, and let it sit out on my counter for 24-36 hours until thickened and mildly sour-smelling. I like to write on the lids with a wipe-able marker so that it’s obvious what’s in them. The jar should sit in a somewhat warmer place in your kitchen. For me, that’s the corner counter beside my stove. Another good place is the top of the fridge. Another helpful thing to do is to write the day that it needs to be transferred to the fridge so that you don’t lose track of how long it has been sitting out for. Mine says Jan.6 so that my mother-in-law knew when to put it in the fridge while I was away at Blissdom. Oops, guess we ate most of the jar before I remembered to take a picture! It’s hard to tell, but the consistency is somewhere between cream and sour cream. Slightly pourable, but definitely thickened. The taste is deliciously but mildly sour. One thing I have found is that the consistency begins a little bit more liquidy and then thickens up slightly once it’s been in the fridge. We love to add our creme fraiche to soups for extra enzymes, on top of any type of Mexican food, with our scrambled eggs (with fresh salsa it’s a knockout breakfast), with potatoes or sweet potatoes, or almost anything else we can come up with. With my kids, it seems that creme fraiche is the new ketchup! What types of cultured dairy does your family regularly eat? Which of those have you tried making yourself? Thanks for this I have always wondered how to make my own.We go through a ton of sour cream in this house. It is almost as sacred as Mr E’s ketchup. @Felicia, We always run out of ours while it’s still good, so I’m not sure, but at least a couple of weeks, probably longer. Great way to get more good “tummy bugs”. We ferment yogurt in a strainer to get a yogurt cheese and use it in place of cream cheese. Yum! Hi, i’ve been lurking in your website for about a week or two, and i LOVE your blog! it’s exactly the things that i’m interested in: real food and cooking, frugality, natural and sustainable living, etc. i also purchased your ebook, and i’m working on the second lesson this week. my only daughter is almost two, and she has been having trouble with eczema and constipation, so my interest in healthy cooking has revived after being a bit dormant for a while. (my husband is more receptive to healthy eating now, so that’s why i can start up again :)) thank you so much for your time in teaching us! God bless you! I notice your remarks about constipation and excema for your daughter. How does this help the constipation. I am a newbie at this though am a grandmother. My granddaughter gets constipated even though they do eat alot fruits. I am wide open for any input to help her. @Jackie, I would consider whether she is eating whole grains (as opposed to refined), how much sugar she consumes, and whether she is getting enough liquids in (especially water, unless breastfed, and then just ensuring that she’s well hydrated). Another thought would be trying some probiotics in her diet- either supplements (like a powder) or probiotic foods, like yogurt, kefir, or lacto-fermented vegetables. Thanks for this post! We’ve been eating a lot of sour cream around here lately and I was just thinking about how I could make homemade. I’m so glad you showed how to make it with store-bought items because we don’t drink raw milk *yet*. It does sound simple and easy. It’s probably like making yogurt, once you’ve done it you wonder why you haven’t been doing it all along! I’m assuming it would be best to use NON UHT heavy cream, right? @Emily @ Live Renewed, Totally just like making yogurt, it becomes so simple and second nature! And yes, definitely avoid UHT cream if you can! Of course, you should always try to avoid UHT cream because that crazy super-duty pasteurization process is just not kind at all to the proteins in the milk. It basically alters them so much that they become like a foreign substance in our body and actually stimulate an auto-immune response again them- not good! Any cream is better than UHT cream! So you can use this as a sour cream substitute in recipes? What about baking? I guess the biggest challenge I’m having, as I read through Nourishing Traditions, is trying to figure out how to incorporate her recipes into the meals my husband already likes and will eat…. Will this work if using ultra pasteurized cream? it’s the only kind I can buy. .-= Julie´s last blog ..Truck Found =-. @Julie, Yes, it will work, but its definitely not ideal. I can’t believe that is all that is available to you! Terrible that so many dairy companies are moving in that direction! I am so thankful that it has not become as big of a thing (yet) in Canada. With that being your situation, I might actually consider sticking with store-bought sour cream. Do companies in the US have to label UHT cream when its an ingredient in a product? I suppose the sour cream could be made with UHT cream as well, but at least there’s a chance that it might not be. Hmmm… know any great farmers you can strike up a deal with instead? Stink. In my state (South Carolina) it is illegal for them to sell me any type of raw milk that has been changed from it’s original state. I can buy raw milk, but not raw cream, butter, ect. Any other cream I can find has been ultra pasteurized. Any online sites I can buy it from? Or would it be better to just use the cream off the top of my milk? @liz g, Oh, that’s tough. I’m not sure of where you could get it online. I’m sure there are options, but living in Canada, I’m just not sure what they would be for you. I think the cream from your milk would be your best bet. I make kefir, kefir cream cheese, and my own cultured buttermilk. Hoping to begin making my own cheeses soon! .-= Laura @ Rejoicing Evermore´s last blog ..Adventures in Traditional Cooking: Kefir Cream Cheese =-. Stephanie, I can’t wait to try this! Do you know if homemade kefir would work in place of buttermilk? @Paula, Actually, I don’t think it would because the bacterial cultures are different. You may get a product that doesn’t resemble sour cream/creme fraiche in the slightest. The thing about kefir is that it cultures through the use of grains, not just by adding it to something and letting it ferment. So I’m thinking it wouldn’t work. 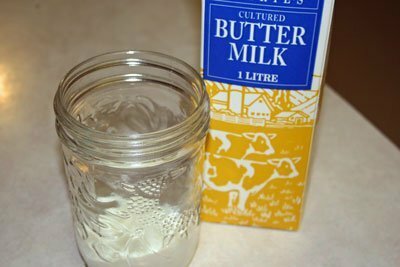 Making your own buttermilk is super easy! All you need is some raw (or any but of course raw is best) milk and a good cultured buttermilk from the store. 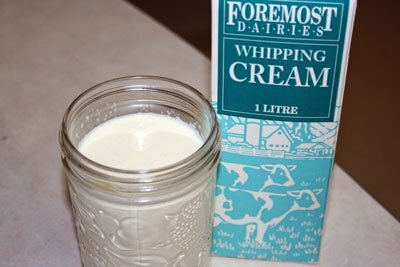 Place about 1/4 C of the buttermilk in a quart jar, and fill the rest of the way with milk, cover and let it sit 24hrs. And whalah! You have raw cultured buttermilk. 🙂 I haven’t tried it with the real buttermilk but I assume it would work the same. I am so thankful I found your blog tonight! I can not keep sour cream in the house; as soon as I buy it is gone. I can’t wait to try to make my own! ok, so I’m new at almost all of this, but I am up for learning! So, I have a few questions…first of all, how long do you keep this out of the fridge after you make it? Second, what is UHT? I’m guessing it has something to do with the pasteurization, right? Thanks for explaining all of this! We make our own yogurt and I’d love to be able to make our own sour cream, too! @lisa, I keep mine out on the counter for about 24-36 hours, until it has begun to smell a bit sour and has thickened up. It won’t be entirely thick until it’s been in the fridge for a little bit. And UHT is ultra-pasteurization. It is now being done to both milk and cream products, and unfortunately many of the organic products are using it as well. It is basically a very high temperature pasteurization process, and it really alters the molecule structure in the milk proteins. These products should be avoided as much as you are able to avoid them! I’m with you Stephanie… it’s so easy! I am very fortunate to be able to purchase raw cream weekly. It is so good, and usually it’s all used up before it starts to sour. Occasionally though, we don’t go through it that fast. First I tried setting it on the counter for a day or two when it began to sour, then moving it back to the refrigerator. YUCK! We just don’t like the taste of cream or milk when it sours in the refrigerator (even after setting it out at room temperature for a few days). Then I read about adding a little buttermilk. That made all the difference! I made this with Organic Valley cultured buttermilk and ultra pasteurized whipping cream(the best available at stop and shop…boo)…after 24 hours it was actually thicker than the sour cream we usually get–and sooooo good! .-= Jana @ The Summer House´s last blog ..Done! =-. @Jana @ The Summer House, I bought mine from my natural foods coop, Azure Standard. But I think you can buy them from most places that carry canning supplies, or definitely you can get them online. I have seen them ! Wal-Mart with the canning supplies. I just found this link via simple bites. I’m really excited to try making this. I recently attended a cheesemaking workshop and I talked to the instructor about making homemade kefir, which I sometimes buy at the store but it is expensive. I have celiac disease so often it is difficult to find sour cream without added starches or stablilizers so, this is great. Thanks! .-= Gina´s last blog ..Have You Met Tom =-. I know I am commenting sort of late on this but thanks so much for this post! I found it through your salad dressing post on simple bites. I have been wanting to make my own sour cream in part to avoid all the additives (although I normally buy the Daisy brand sour cream which lists “cultured cream” as its only ingredient) but also so I don’t have the #5 plastic container to try and do something with. Where I live we can only recycle #1&2 so buying things like sour cream which are #5 create a hassle. Anyway, thanks again, I can’t believe how easy this is! Do you have a recipe to make your own buttermilk? Ok, I just have to check in also. I made sour cream for the first time yesterday and I had to use UHT cream as well (I didn’t realize it until the sour cream had been on top of my fridge almost 24 hours), but it turned out great. Mine did thicken up a lot more than I had expected, pretty much like regular sour cream. It does taste great. I just found your site through Simple Mom and I’m so excited to try this out! 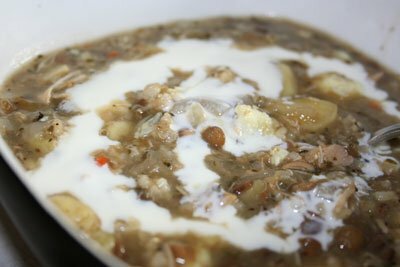 I have a question about making the second batch of sour cream. Do I take some of the original batch of sour cream and make more (like yogurt)? Or do I need to start over each time? Thanks! @Karen, With this particular recipe, you start with the buttermilk and cream, not the sour cream you just made. 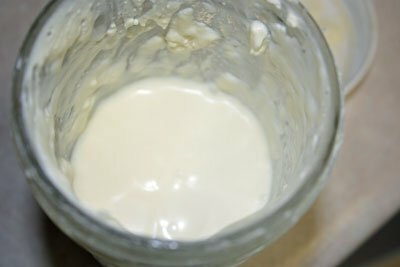 I make a thick and mild yogurt which substitutes quite well for sour cream. I use an Easiyo yogurt maker, Yogourmet starter and Horizon Brand Half and Half. Horizon, although ultra pasteurized, is the only brand available where I shop with out all the extra ingredients. I don’t believe I have ever had creme fraiche but wonder if the yogurt I make is not basically the same. Sour cream from Hispanic producers is different as well but I don’t know if it is more like creme fraiche. Hi! I love this idea and actually made a small amount and it tasted great, however I am trying to conceive and I am worried about listeria. Advice please! I also made some buttermilk but I got so nervous that I dumped both out. Mainly I was nervous because it was taking to long to use either and I thought better safe than sorry. I would love to do another batch and actually date it and use it quicker but I am concerned. Please, any thoughts are welcome. How long will the creme fraiche last in the fridge? 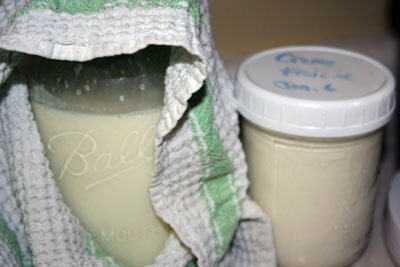 I make my own milk kefir with the milk kefir grains. I have used 35% cream and fermented using the kefir grains, after 40ish hours of fermenting, I separate the thicken cream and kefir grains. And then after I place the fermented thicken cream and strain the why through a brown paper coffee filter. I end up with whey which can ferment vegetables, used in sourdough, or used like muscle builders and also lovely sour cream which is not unlike crème fraîche. I have a concern with leaving the cream out at room temperature for that long. Won’t it become rancid and cause tummy troubles, or food poisoning?